Cherry Laurel (Prunus laurocerasus): growing, planting, caring. Widely cultivated ornamental plant in gardens and parks in temperate regions worldwide, often used for hedges or as a screening plant. Prunus laurocerasus - the cherry laurel, or common laurel - is a species in the family Rosaceae native to regions bordering the Black Sea in southwestern Asia and southeastern Europe. It is an evergreen shrub or small to medium-sized tree, growing to 5 to 15 metres (16 to 49 ft) tall, with dark green, leathery, shiny, leaves with a finely serrated margin and small flowers 1 cm wide, with five creamy-white petals and numerous yellowish stamens with a sweet smell. Most cultivars are tough shrubs that can cope with difficult growing conditions, including shaded and dry conditions, and respond well to pruning. Examples are 'Aureovariegata', variegated, leaves with a yellow margin, 'Magnifolia', with large leaves up to 30-cm wide and 'Otto Luyken' a dwarf species with small leaves 10-cm wide. This plant is one of many plants called "laurel" because of the appearance of their leaves, elliptical, leathery and shiny. It has nothing to do with the genus Laurus, since it belongs to the family Rosaceae and the genus Prunus. It is an evergreen tree, up to 8 meters tall if planted alone. Leaves are leathery, simple, alternate, shiny, elliptical to lanceolate. The inflorescences grow in erect clusters growing in the axils of the leaves. They are composed of small white flowers (corolla 5 lobes) with a single style surrounded by many stamens. 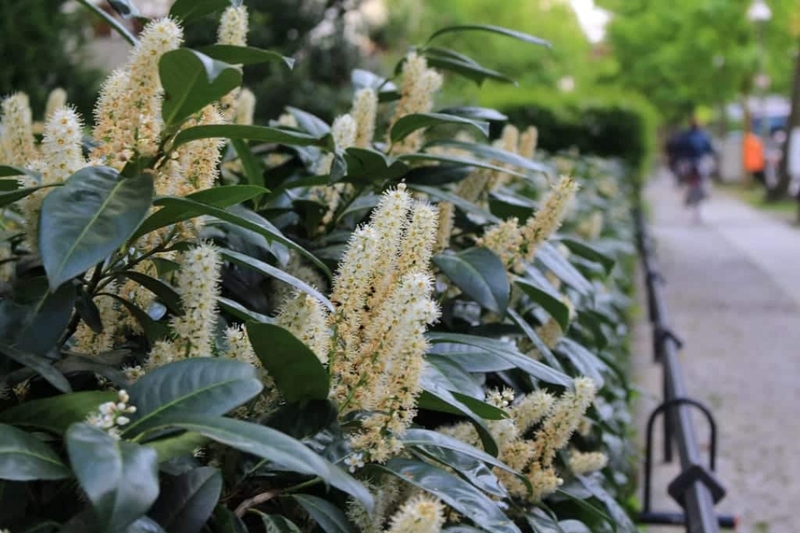 Plant the cherry laurel from October to March out of freezing period - a planting before the winter allows a better rooting - in a sunny situation. Laurel gracefully accepts any type of soil. In hedge, separate each foot at least 80 cm to 1 m for a hedge about 2 m high. Before planting, prune damaged roots and branches to balance root volume and aerial volume. Plant in a hole at least twice as big as the root ball. Soaking the roots before planting will greatly improve the chances of recovery. Plant being careful not to bury the base of the trunks. Form a bowl around the base that will be used for watering during the first months. Tamp the soil around the roots - do not hesitate to use all the weight of the body! Finally water until filling the planting bowl, at least two watering cans! The cherry laurel does not fear pruning, even if it is severe. You can prune your shrubs in the spring and fall. Trim once a year in the fall, in downspring, if you want to slow down its growth, or on the contrary trim in spring so that your laurels grow faster. Water thoroughly the first few weeks. Beyond the first year, you shouldn't need to worry about it. Water copiously but infrequently to encourage the root system to seek water deep underground. It's therefore suitable to water until the planting basin is full and only empties slowly. Mulch the base of young trees the first year with wood chips or bark.